Panda Security, a world leader in advanced cybersecurity solutions and services, announced today that CRN®, a brand of The Channel Company, has named Joao Caires, VP of Sales, North America, to its prestigious list of 2019 Channel Chiefs. The top IT channel leaders included on this list continually strive to drive growth and revenue in their organization through their channel partners. Caires was included on this year’s Channel Chiefs list due to the massive changes he brought to Panda’s channel strategy over the last year as VP of Sales, North America. From expanding internal roles, to encouraging sales representatives to be more channel-focused, to restructuring marketing and support offerings to meet partners’ needs, Joao worked tirelessly to completely reinvent Panda Security’s channel sales organization. The momentum he created will continue through 2019 and beyond, as Panda embraces a 100% Channel Sales strategy in North America. 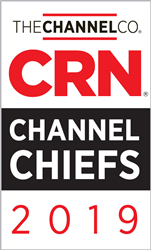 The 2019 CRN Channel Chiefs list, including the 50 Most Influential Channel Chiefs, is featured online at https://www.crn.com/channelchiefs and will appear in the February 2019 issue of CRN. Panda Security is one of the world’s leading providers of advanced cybersecurity solutions and services. Our Smart technology, based on big data and AI, monitors every running application on your systems and classifies absolutely everything. Unlike traditional antivirus solutions, which only take action if a process is malicious, our technology detects attacks before they even happen.